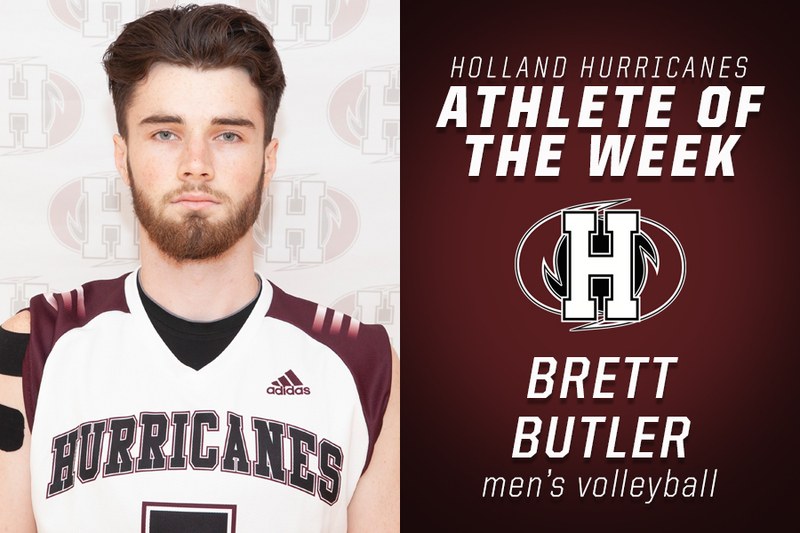 Volleyball players, Taylor Allen and Brett Butler, have been named the Holland Hurricanes Athletes of the Week for the week ending February 10. Allen, a first-year outside-hitter from Fredericton, NB, had a strong weekend in Halifax, NS for the Hurricanes. In Saturday’s straight-sets victory over the UKC Blue Devils, Allen contributed with three kills, three service aces and four digs. She followed this performance with seven kills, a service ace and 15 digs in Sunday’s five-set loss to the top-ranked MSVU Mystics. Taylor Allen is studying in the Human Resource Management program at Holland College. The Hurricanes are currently in a tie for third place in the ACAA standings with a record of 12-6; they sit just two points out of second with two games in hand over the UNBSJ Seawolves. The ‘Canes have just three regular season games remaining, with their final home games scheduled for this Saturday and Sunday versus the UKC Blue Devils at the Holland College Centre for Community Engagement. Butler, a fifth-year left side from Charlottetown, PEI, led the Hurricanes in a weekend split with the top-ranked STU Tommies at the Holland College Centre for Community Engagement. In Saturday’s five-set loss, Butler recorded 16 kills and five digs, before 14 kills, two service aces and ten digs in a four-set win on Sunday. Brett Butler is studying in the Sport & Leisure Management program at Holland College. The Hurricanes, 7-7, are currently in third place in the ACAA standings. They will conclude their regular season at home this Saturday when they host the Université de Sainte-Anne Dragons at 7pm at the Holland College Centre for Community Engagement. The Holland Hurricanes will host the 2019 ACAA men’s and women’s volleyball Championships at the Holland College Centre for Community Engagement on February 22-24. While the women’s schedule at the conference championships is yet to be determined as they jostle for position in the standings, the men are set to face the UNBSJ Seawolves in semi-final action on Saturday, February 23 at 7pm.